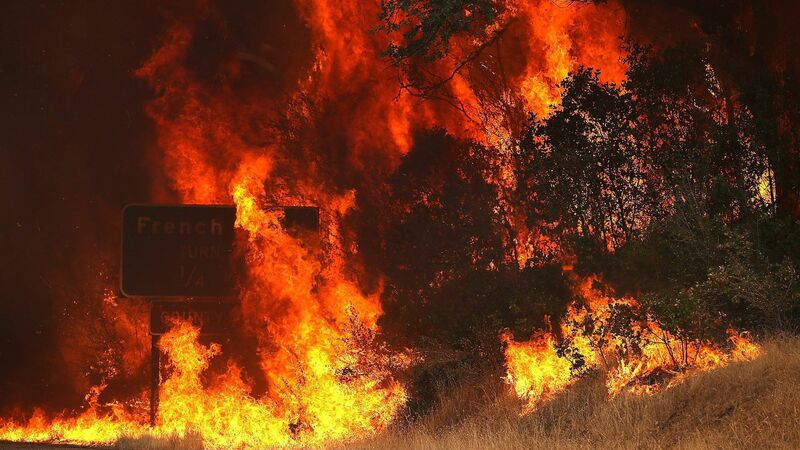 On July 27, the Carr Fire in California's Sacramento Valley transformed from a modest wildfire into a nightmarish, towering inferno, complete with a rotating smoke plume and roaring winds on its periphery. The fire manufactured its own weather as it exploded in size, took off down hills and across a major river, and became a killer as it entered the city of Redding, home to nearly 100,000. Why this matters: What researchers learn about the fire's extreme behavior could save lives, as climate change makes fire conditions more volatile across the West. Exactly how this "fire whirl" or "firenado" — depending who you talk to — happened, and what this phenomena should be called, is a matter of active scientific research. How this works: Neil Lareau, an assistant physics professor at the University of Nevada at Reno who specializes in fire weather phenomena, said the rotating cloud that looked like a nuclear explosion is an extremely rare occurrence. Based on observations from three National Weather Service Doppler radars, video footage and eyewitness accounts on the ground, Lareau thinks the fire's behavior as it roared into Redding — jumping over the Sacramento River in the process — shows that it may best be classified as an actual tornado. “I’m relatively comfortable calling this a tornado, I’m sure some people will take issue with it." Lareau closely studies the billowing smoke plumes that rise above intense wildfires, which are known as pyrocumulus or pyro-cumulonimbus clouds (pyro is the Latin prefix meaning "fire"). The plume that rose high above Redding helped set the stage for the nightmare that descended upon the city of nearly 100,000, killing at least 6, including a woman and her two great-grandchildren. Between the lines: The Carr Fire's rotating smoke plume acted as a chimney, venting heat and smoke away from the blaze, and sucking in air from surrounding areas. Plume-dominated fires, Lareau told Axios, occur in settings with relatively light winds but plenty of instability in the atmosphere, and their behavior can be erratic. What's so rare, though, is to have a large part of the plume spinning like a tornado one might see in Oklahoma, creating damaging winds on its periphery, and rendering firefighting efforts futile. Lareau said when the rotating part of the smoke plume intensified, the top of the smoke plume suddenly ballooned from 18,000 feet high to 38,000 feet, a feat that might not have been possible otherwise. A key area of inquiry is how the fire's exhaust plume began rotating in the first place, at around 6:50 p.m. local time on July 27. By 7:45 p.m., the core of the vortex had stretched vertically all the way to 15,000 feet, a phenomena normally seen in intense tornadoes. Lareau noted that terrain-generated interactions, the extreme temperature differences on the edges of the fire and other characteristics of big blazes can cause wind shear to develop near a fire, leading to a circulation. “Once the rotation gets going, it sort of self-intensifies in that it further lowers the pressure, which draws in more air; it further increases the rate of rotation; further increases the updraft," he said. The National Weather Service and CalFire announced Thursday they are conducting a "storm damage survey" regarding the "large fire whirl" that struck Redding. "Preliminary indicators placed max wind speeds achieved by the fire whirl in excess of 143 mph," the Weather Service said in a Tweet. What's next... To unlock the mysteries of such fire whirls, Lareau and his colleagues are awaiting a new research asset: A truck-mounted, high-resolution Doppler radar, thanks to funding from the National Science Foundation. “That new radar is really going to be an amazing tool” for analyzing fire behavior, he said. Ultimately, it could save lives by getting residents and firefighters out of harms' way. Meanwhile, California's wildfire crisis continues amid one of the state's hottest months on record. Firefighters are slowly gaining ground on the Carr Fire. As of Wednesday morning, the Carr Fire ranked as the state's seventh-most destructive wildfire on record, having burned 115,538 acres and destroyed more than 1,000 structures. It was 35% contained. However, other fires have erupted north of San Francisco, prompting new rounds of evacuations there. Editor's note: This story has been updated to include the investigation by the NWS and CalFire into the damage caused by the fire whirl in and around Redding.